Price reduction!!! A rare opportunity to own an amazing property designed by High Victorian architect Frank Furness! 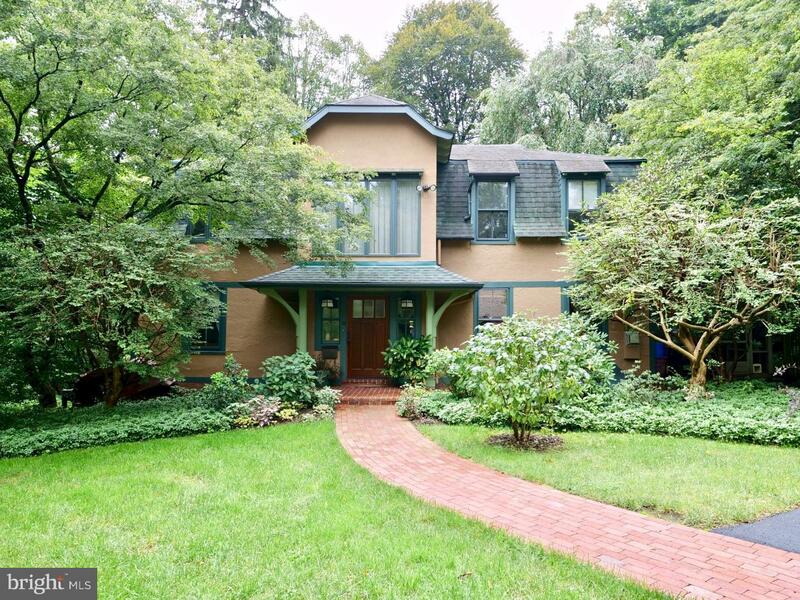 Down a quiet tree lined lane and tucked behind a manicured hedgerow this unique property surrounded by mature trees and flowering shrubs, was once a part of the Lindenshade mansion dating to 1873. The home has later additions and significant upgrades and sits at the end of the cul-de-sac on 1.75 gorgeous acres with formal gardens, open lawns and stately trees all around and just a 5 minute walk to Wallingford train station. Walk up the meandering brick front walk into a spacious entrance foyer. The dramatic open concept staircase adds a bit of a contemporary flair to this vintage property and this feeling continues into the large kitchen with original wide plank flooring, 6 burner Viking range, large eating area and quality wooden cabinets and soap stone countertops. Exit to a screened porch for warm weather enjoyment and a small pond. Through the French doors into the den which can easily double for a dining room occupies the opposite side of the foyer with wall to ceiling bookcases and entertain royally in the gracious living room with a gorgeous wood burning fireplace. An easy exit through double doors to a large deck with a whimsical metal sculpture by a well known Houston artist. A very unique 2nd floor layout consists of 4 bedrooms, 2 of which are joined by a small study perfect for computers or a playroom. The master bedroom is enormous with a full wall of built-in closets and the new master bath with heated floor and soapstone vanity. An attic and a full basement add loads of addition storage with a large workshop area. There are many special touches throughout including a large second floor landing/loft lined with bookcases and a Jotul gas fireplace in the kitchen adding a cheerful and warm atmosphere. A very unique and artful property for buyers that enjoy a perfect combination of old world charm and modern comfort!